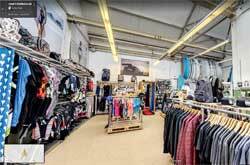 ... is your dedicated surf shop, snowboard shop, telemark shop, sup shop, freeski shop, and skate shop in Switzerland. In our shop in Winterthur you will find the biggest range of Surfboards and SUP Boards in Switzerland. We also have an all-embracing offer on surf- and SUP accessories such as Fins, Boardbags, Leashes, Grip Pads, Paddles, Bodyboards, ... And of course, if you are looking for the right wetsuit this is the place to go - we carry a huge range on wetsuits, boardshorts, bikinis, streetwear, beachwear, sneakers, etc. We're looking forward to seeing you soon at your 'local surfshop'! Our Winter range contains a wide variety on telemark gear and a good selection of snowboards of various brands. In addition, we produce our own brand Play Snowboards in our local factory and offer customized snowboards with personal graphic designs. The Bullant is perfect for waves shoulder high and under, I have fo..
HIGH SUN PROTECTION FOR YOUR BODY The SWOX SUNSCREEN LOTION 30 is a.. EXTREME SUN PROTECTION FOR FACE AND LIPS SWOX SUNSCREEN COMBO 50 + ..
High protection sunscreen for nose, cheeks and forehead. Highly ..
All Natural sunscreen utilizing Mineral Actives. Smooth, rich cream ..
Rottefella Freedom is the binding for those who seek freedom and cha..
A plush towel poncho to make changing in public places cozy and easy.. Recommended for the daily use.